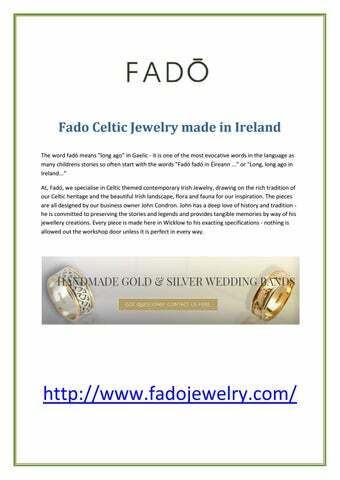 Fado Celtic Jewelry made in Ireland The word fadรณ means "long ago" in Gaelic - it is one of the most evocative words in the language as many childrens stories so often start with the words "Fadรณ fadรณ in รireann ..." or "Long, long ago in Ireland..." At, Fadรณ, we specialise in Celtic themed contemporary Irish Jewelry, drawing on the rich tradition of our Celtic heritage and the beautiful Irish landscape, flora and fauna for our inspiration. The pieces are all designed by our business owner John Condron. John has a deep love of history and tradition he is committed to preserving the stories and legends and provides tangible memories by way of his jewellery creations. Every piece is made here in Wicklow to his exacting specifications - nothing is allowed out the workshop door unless it is perfect in every way. 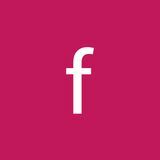 Fado Handmade Jewelry from Ireland. Engagement Rings and Wedding Rings made by master craftsmen in our Dublin Workshop.